In times like these, when marginalized communities sense the threat of violence for their own livelihood and well-being, words fail. Words fail because the injustice seems insurmountable. Words fail because the system that is supposed to bring justice feels irreconcilably broken. Words fail because we can’t fully articulate the profound anger, sadness, and frustration that this decision of the non-indictment engenders in us. But, as Audre Lorde so importantly reminds us, our silence will not protect us. As a queer, mixed-race scholar trying to understand the politics and policies of this country, the injustice of the events surrounding the murders of both Eric Garner and Michael Brown and a decision not to indict the police officers involved with their murders rings out as a clear cry that “injustice anywhere is a threat to justice everywhere.” I cannot stay silent, and I also recognize that I cannot say enough. I must step forward, not back, to stay in relationship with those who are counted as other, marginalized, and disconnected from systems meant to support and protect them.The violence that has been perpetuated against Mike Brown and the Ferguson community by the non-indictment of Darren Wilson not only minimizes the violence against black bodies, but also affirms a sense of dominance over marginalized communities. We, as a social justice community, need to affirm, as the hashtag did that emerged after Mike Brown’s shooting, that #BlackLivesMatter. We have a role to play in dismantling the racism that allows for such violence to go unchecked by our legal system. However, we also need to recognize that Ferguson goes beyond race to bigger questions that demand our solidarity and personal ownership of our own privileges. Yet, what Ferguson exposes most clearly is that the black/African American community continues to be threatened due to the militarization of the police. Two months ago a twelve-year-old boy was shot by a police officer in Cleveland. And also in November, a young black/African American boy was tased in the face by police! In the midst of this injustice we cannot stay silent. As someone who looks to the myriad of religions existing in this world and the overwhelming message of peace and justice that emerges from the multitude, I suggest we must identify the racism inherent in our culture that led to the death of Mike Brown, and also recognize that a racist system privileging whiteness does harm to all of us–regardless of the color of our skin. We know that no one is fully free until we are all free. To end this struggle, we need to join together with our black sisters and brothers to help usher in a lasting peace and justice. During the holiday season, Christians celebrated Advent, where we wait expectantly, hopefully, watchfully for the impossible, for the heavens to open up and God to descend down upon us. As the prophet Isaiah proclaims in today’s lectionary text, when God did what the people did not expect, that was precisely the moment when God was with us. As I join with my brothers, sisters, and others who work for racial justice and peace, it can feel like waiting and working for the impossible, especially when injustice is so clearly perpetrated against our black and brown brothers and sisters. As Isaiah reminds us, it can be tempting to too easily only identify as those who are righteous and ignore our own iniquities. In the season of Advent, we can watch and wait for the mountains to move and the impossible to be made possible, but we cannot stay silent in the face of injustice. Advent is not the only tradition that is celebrated during that time. I am also mindful that we celebrate Hanukkah, and my Jewish friends commit themselves to destabilizing the darkness that surrounds us and instead commit to a life full of radiant light. I join with them because we all know that dispelling the darkness of this world that is seen and experienced in the rampant racism and decisions like that of the non-indictments further solidify systems of injustice. And, so, though I have no official commitments to institutionalized religion, I celebrate the religious practices that help to bring justice into the world. Let justice reign on! We must respond to the events in Ferguson from a critical and generous place – an intersectional space that demands attention to the particularities of difference that threaten our collective flourishing. As a queerMestizaje, it is the recognition of our shared kinship, rooted in our experiences of injustice that demands this intersectional response from me. While most of my work has been in LGBTIQ communities, I stand with those who are pushed to the lip of existence–a reality that threatens all of us. The LGBTIQ movement has demanded justice for all persons, and during these moments of processing the decisions of the non-indictments, I remember that it was Martin Luther King, Jr. who modeled for us a way to be peacefully resistant to politics and policies that only serve some and bring calamity to the marginalized. When words fail us, perhaps it is the moment to turn to the God of Love, whose passion for the flourishing of all humankind is beyond the capacity of our words to contain. We can rely on the Spirit who “intercedes for us with sighs too deep for words” (Romans 8:26). By crying out to the divine who is beyond words, we can be heard into enacting radical social change, so that we might find the words to speak God’s love into the depths of human pain. This moment in Ferguson calls all of us to remember those that have struggled for justice (whatever the injustice has been) that in their work is rooted a collective memory and imagination for a better world. Now consider, we are ALL God’s people. Robyn Henderson-Espinoza, self-identified as Christian Agnostic and Queer Mestizaje (of Mexican & Anglo heritage), is a Ph.D candidate in the Joint Ph.D. program at the University of Denver-Iliff School of Theology, Denver, CO focusing on Constructive Philosophical Theology with a primary interest in the ethics of interrelatedness stemming from a New Materialist account. 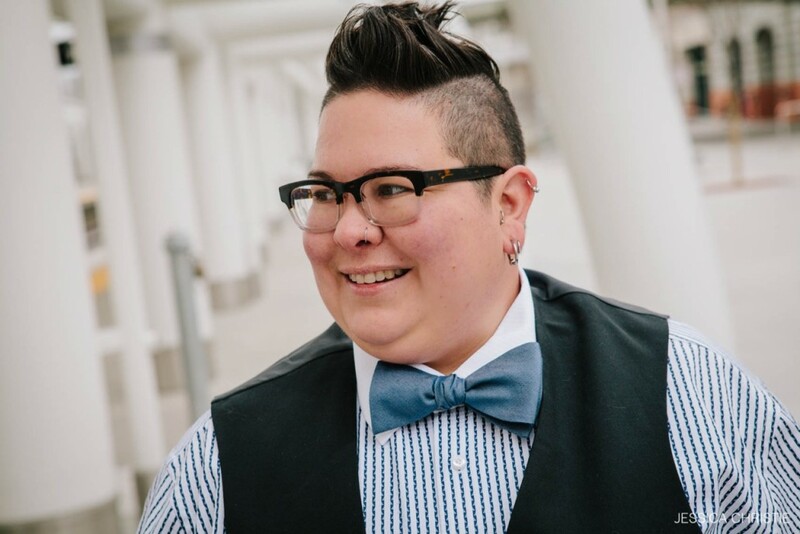 Robyn’s work exists in the in between spaces of ontology, epistemology, and ethics, working to establish a speculatively queer material realism. This piece originally appeared at Tikkun Daily Blog on January 14, 2015.